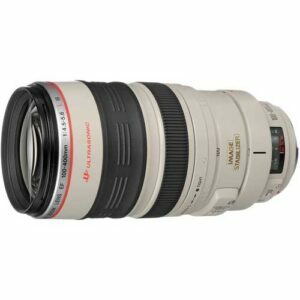 Lens Description: L-series super telephoto zoom lens equipped with an Image Stabilizer. The fluorite and Super UD-glass elements largely eliminate secondary spectrum. The floating system also ensures high picture quality at all focal lengths. The Image Stabilizer has two modes and it is compatible with Extenders 1.4x II and 2x II. 1. This lens has one of the earliest generation of image stabilization. As such, it really does need some skill to master it hand-held. But this is no different from most other super-telephoto lenses. If you can work with the capabilities of the lens, the average quality of your shots go way up. 2. This model lens suffers from less-than-average quality control for a Canon L series lens. You can get a softer-than-expected lens. However, I’ve seen some extraordinarily sharp versions as well. Mine is sharper than average, but I tried several lenses with a resolution test sheet in a very accommodating local store to pick mine. I suggest you do something similar. People often seem concerned by the push-pull zoom design, citing a lack of control and the risk of dust getting into the lens. Firstly, like any new interface, the push-pull is something that takes some getting used to. Yes, extremely precise control has been sacrificed, but the increased speed at which you can adjust the zoom (particularly for things like birds in flight) is a huge benefit with practice. The best thing about the push-pull design, is that this makes the 100-400 able to shrink down to a size no other 400mm lens can. This is space-saving feature is amazing for those who travel a lot. However, while it is smaller when packed, there are lighter 400mm capable lenses out there, which I’ll mention below. As for the dust issue, personally I’ve never found it to be a major issue, and I’ve photographed volcanoes erupting with dust and ash everywhere. I’ve even shot in the deserts of the US, and Australia during dust/sand storms. Obviously changing DSLR lenses in these conditions is a bad idea, but if you have a decent amount of common sense, I don’t think this lens will disappoint. However, having a brush/air-blower (or better yet, a vacuum cleaner) to get the dust off when you can is going to be helpful for any lens. The 100-400 4.5-5.6L is a very tough lens, and I’ve only had one issue with it when I tripped over, and dislodged one of the ribbon cables that controlled the auto focus mechanism. I sent it to Canon to be repaired. Incidentally, it was cleaned as part of the service, but I certainly didn’t notice a sudden improvement in image quality, as I haven’t seen much dust in it at all. As a relatively light-weight, daylight (or bright condition) telephoto zoom lens option, especially for travel, this lens is extremely useful. It’s also been called the “best zoo lens”. Bird watchers, nature photographers, even sporting events photographers regularly use the 100-400 with some great results. It’s true that this lens has been replaced by the mark two, (Mk II) which boasts better image stabilization and focus capabilities. However, optically I find there’s little difference. Certainly not enough for me to upgrade. However, you may find that the Mk II is a better fit. Overall, I like what this lens can do, the value you can get by purchasing one of the mark 1’s (if you can check the quality of it first) now that the mark 2 is out is quite amazing. Try it for yourself before you put too much stock in others opinions. Otherwise, a slightly sharper, lighter, and cheaper option might be the Canon 400mm F5.6L. It has NO image stabilization at all, but for the money is an uncontested L series quality 400mm prime lens that focuses faster than the Sigma 150-500, and there’s simply no equivalent by Nikon or Sony in this price bracket.